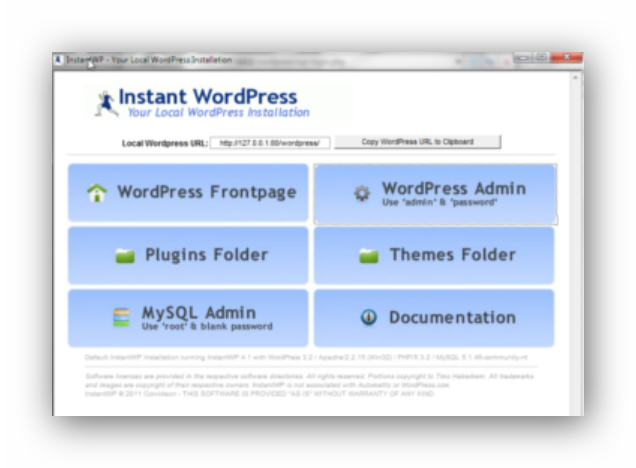 Instant WordPress is a local installation containing a stack of Apache, MySQL and PHP. It is possible to copy the online content to an IWP installation using the same NIMVA theme by using Theme Options>Backup Options>Transfer Theme Options Data. The copied code is posted into the IWP theme using the same options. This does NOT copy any plugins NOT installed by default with NIMVA.. The only encountered problem was with the menus and these may have to be rebuilt. This is possibly due to the menus being corrupted when sample data was added to IWS because local memory is set to 40meg and 72 are required. Also when the same sample data was installed online, the menus were corrupted. Further information on IWS can be obtained by clicking the button below. The local folder containing NIMVA has been installed to InstantWP442. More information to follow on IWP.